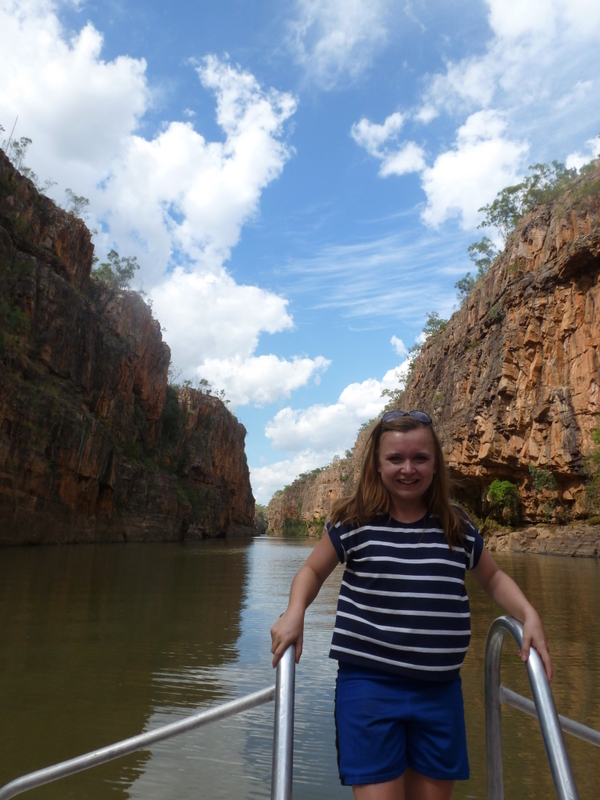 Since part of my Wayoutback tour had been cancelled, I was provided with the option of a day trip from Darwin with AAT Kings. 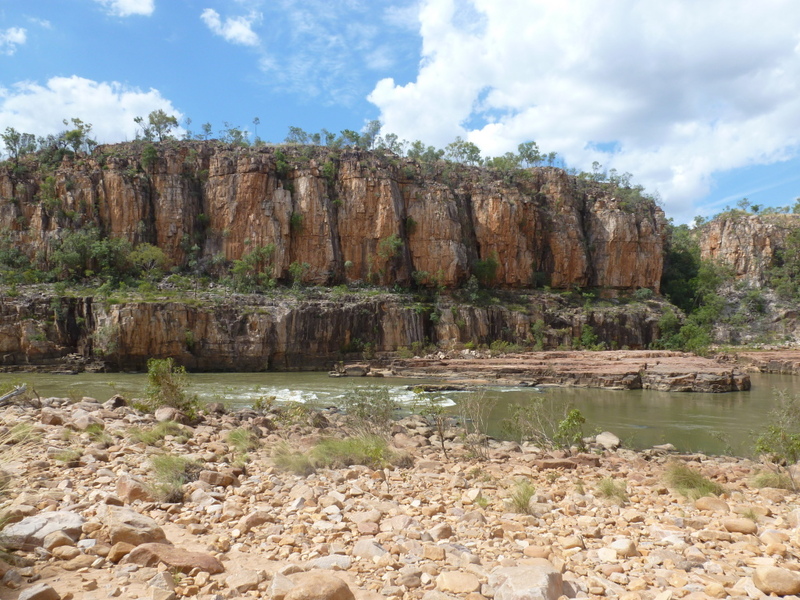 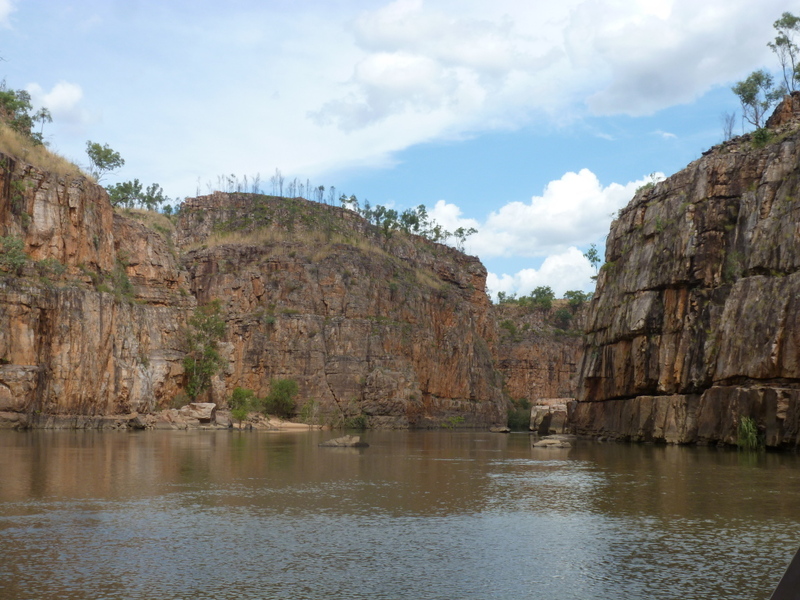 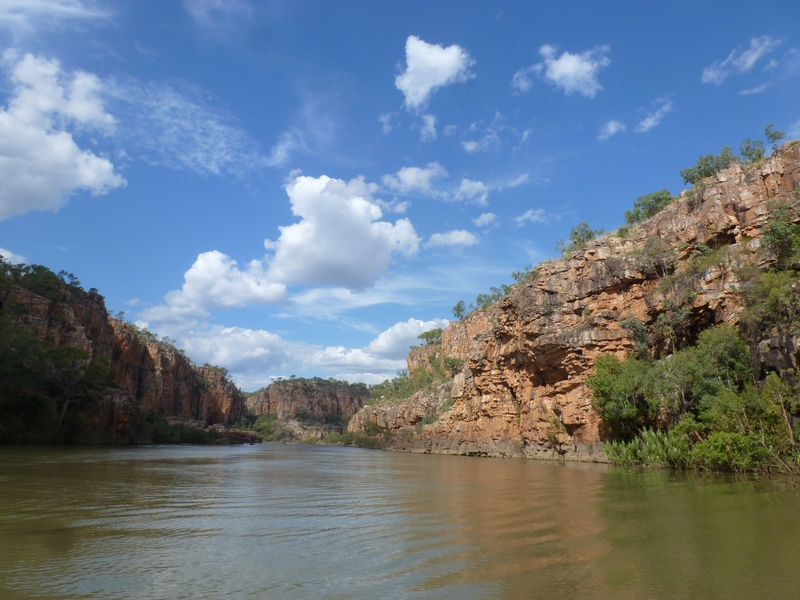 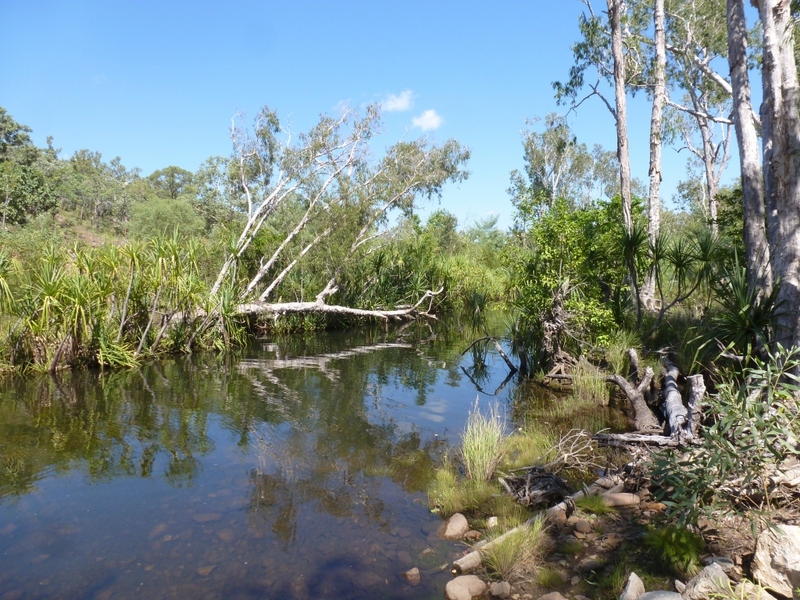 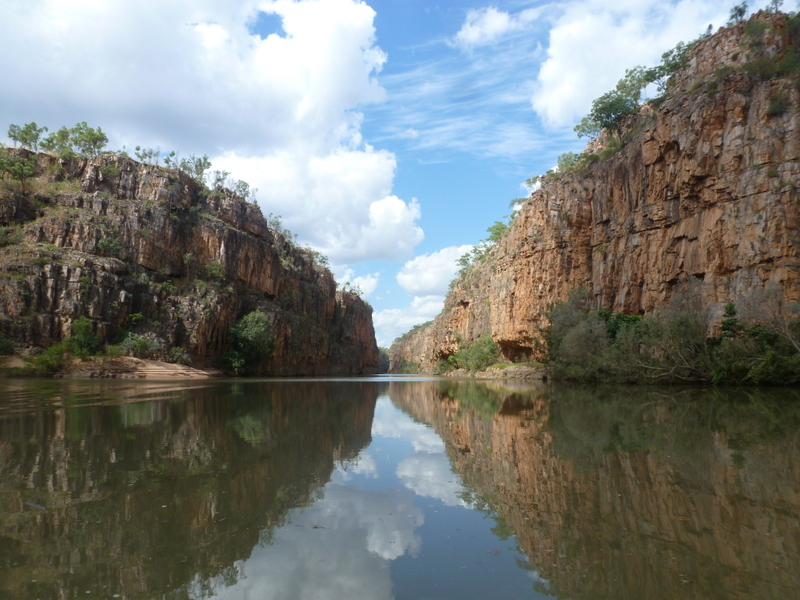 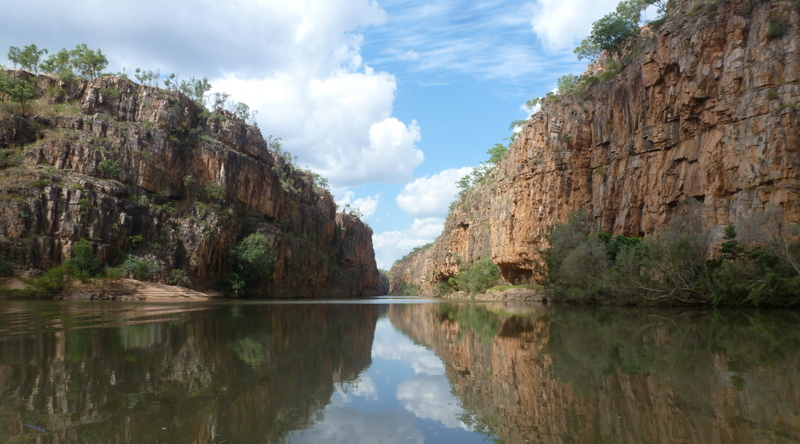 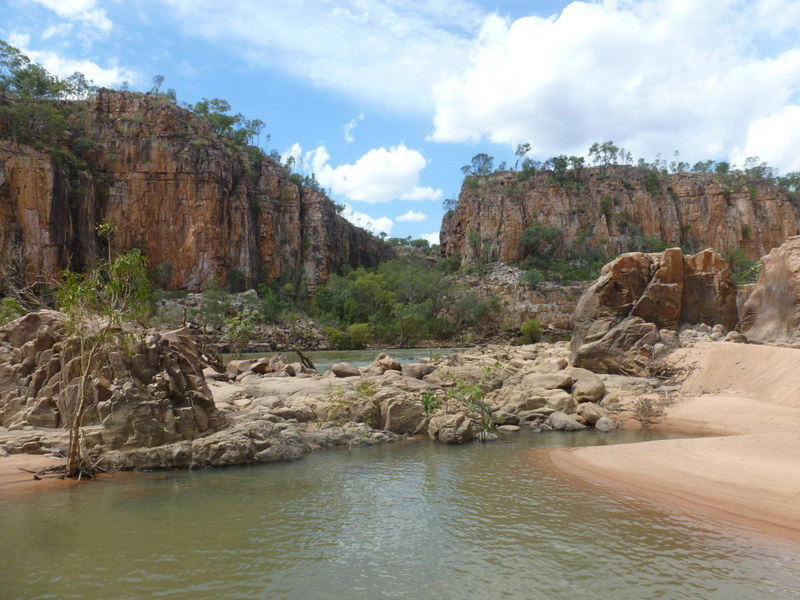 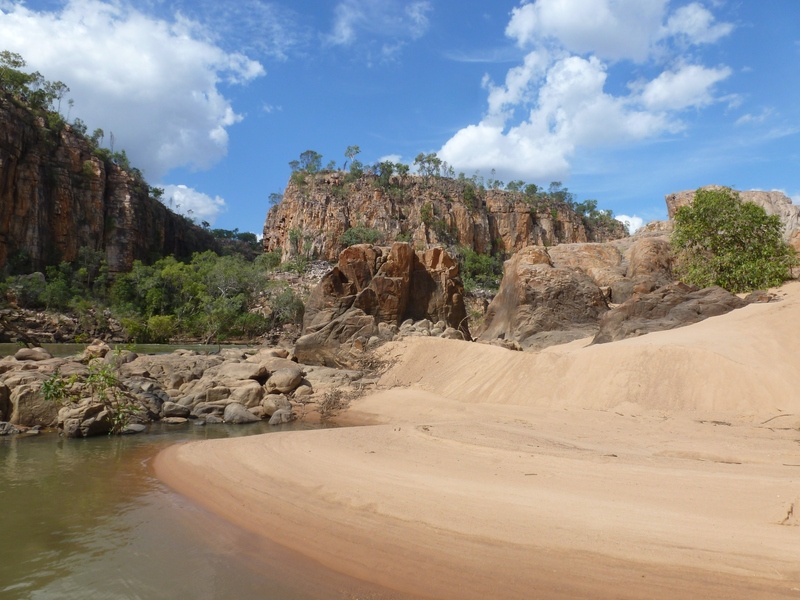 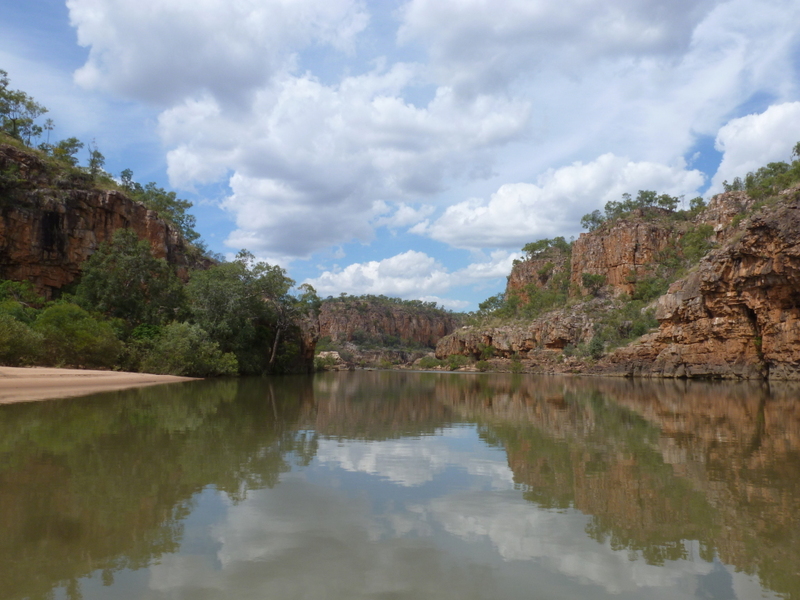 This tour, travelling down the Stuart Highway into Nitmiluk National Park, would take me to see Katherine Gorge. 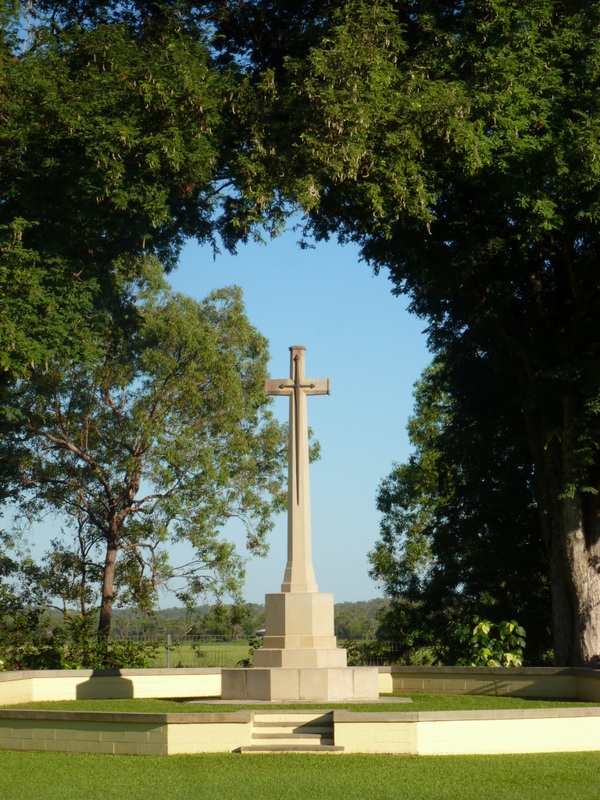 After an early start, we reached our first stop: Adelaide River War Memorial, dedicated to the men and women from the Northern Territory who lost their lives in World War II. 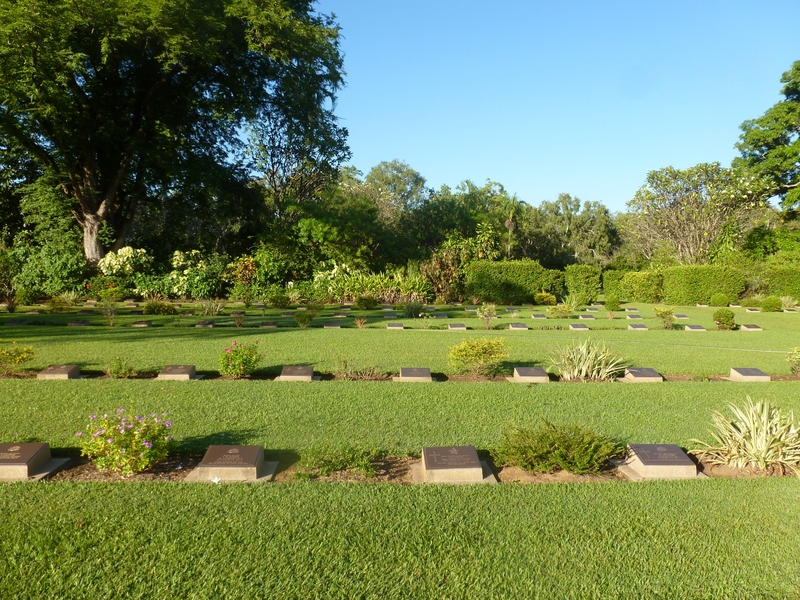 This was a very poignant but peaceful spot, with kangaroos hopping around the memorial enclosure. 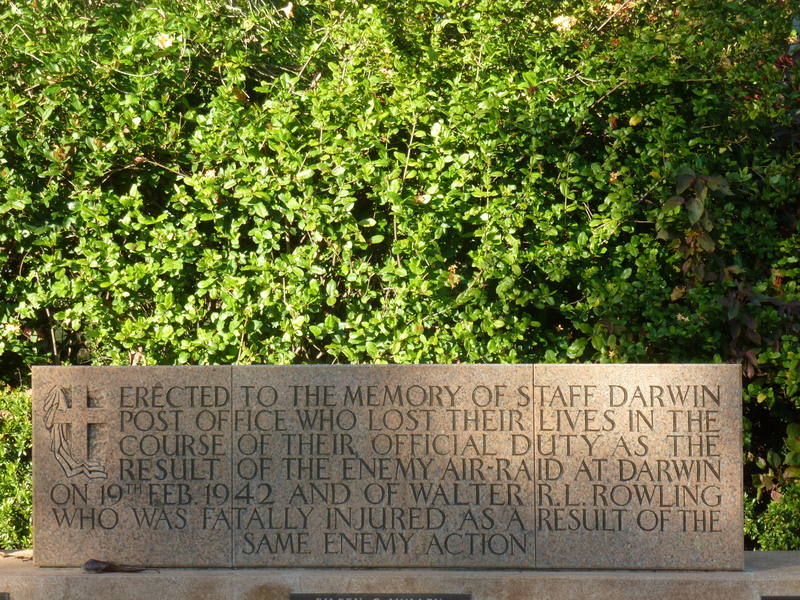 When we got back on the bus, we watched a video about the bombing of Darwin. 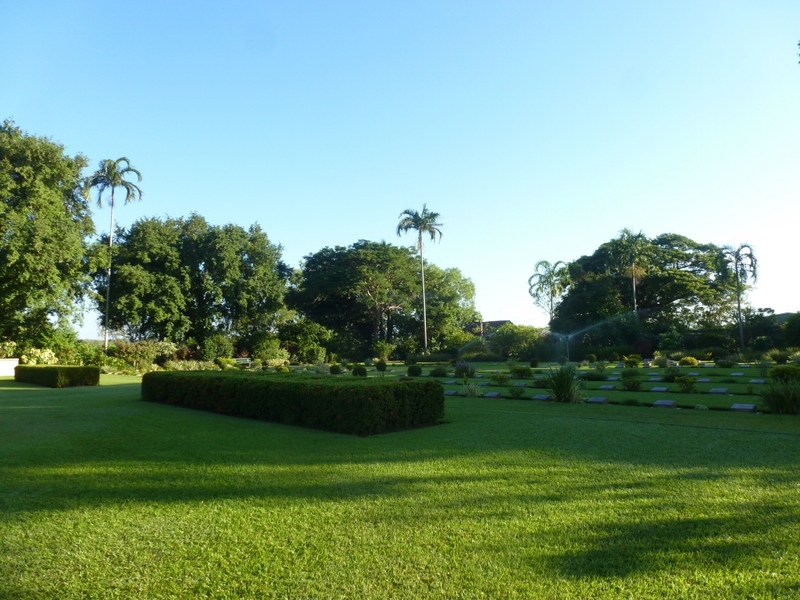 The attack, like Cyclone Tracey, seems to have been a pivotal point in the city’s history. 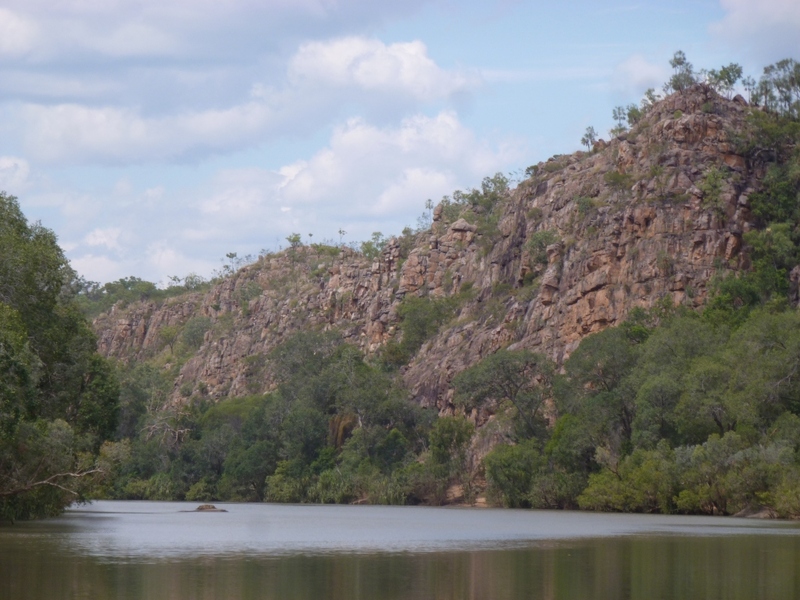 We passed salmon gum trees, turkey bush and kites on our way into Nitmiluk National Park. 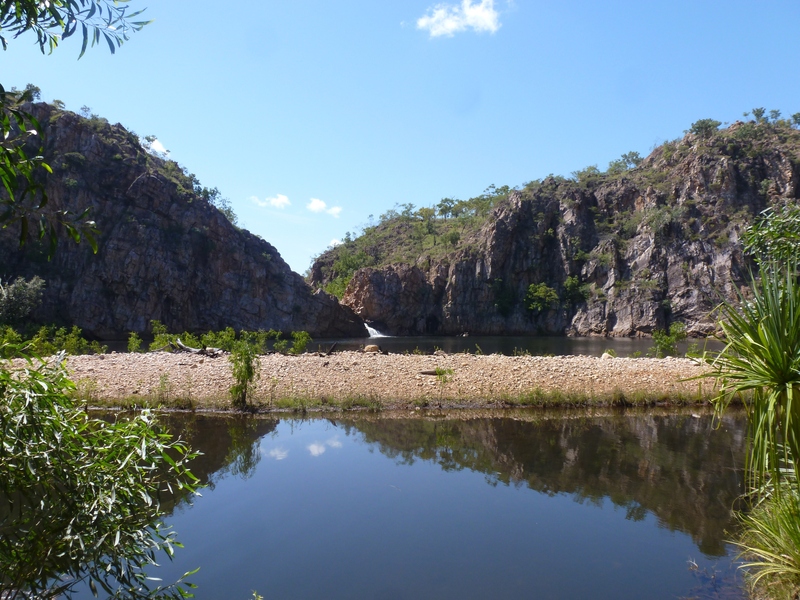 Our next stop was Leliyn (Edith Falls), where we were not able to swim due to a lurking crocodile. 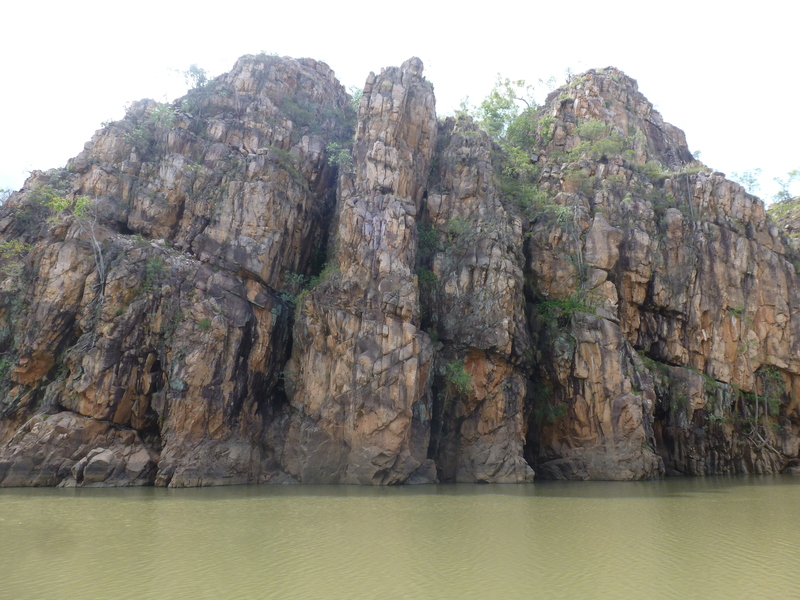 I missed out on seeing the Devil’s Marbles, which had been on my cancelled tour itinerary, but this rock formation looked very similar. 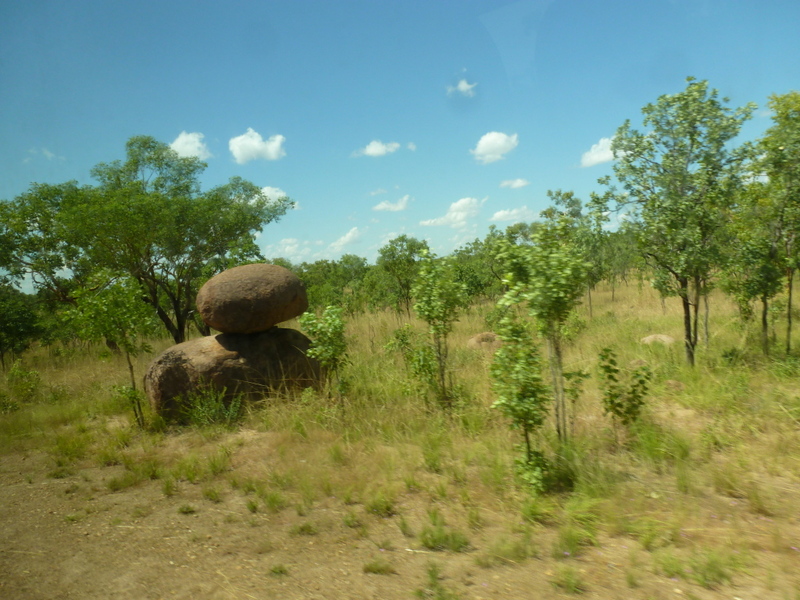 We had lunch at the Nitmiluk Visitor Centre, where there was a little museum about the park. 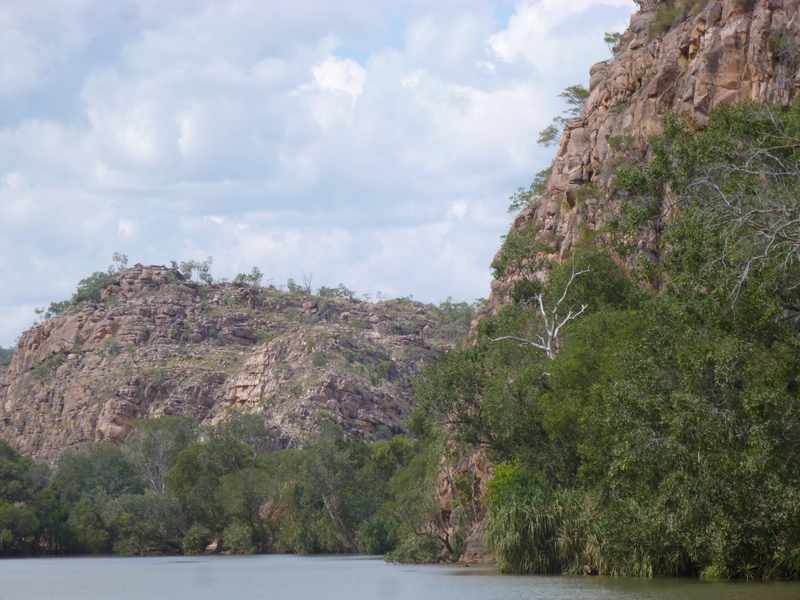 Apparently Nitmiluk means ‘cicada place’ in the local Jawoyn language. 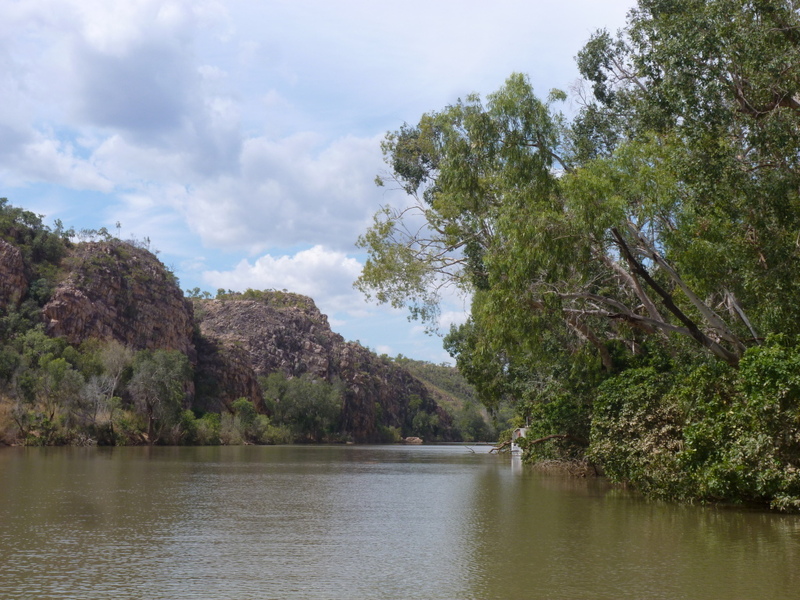 The centre also sold Aboriginal art, and I was able to ask the resident artist, named Long John Dewar, about his work. 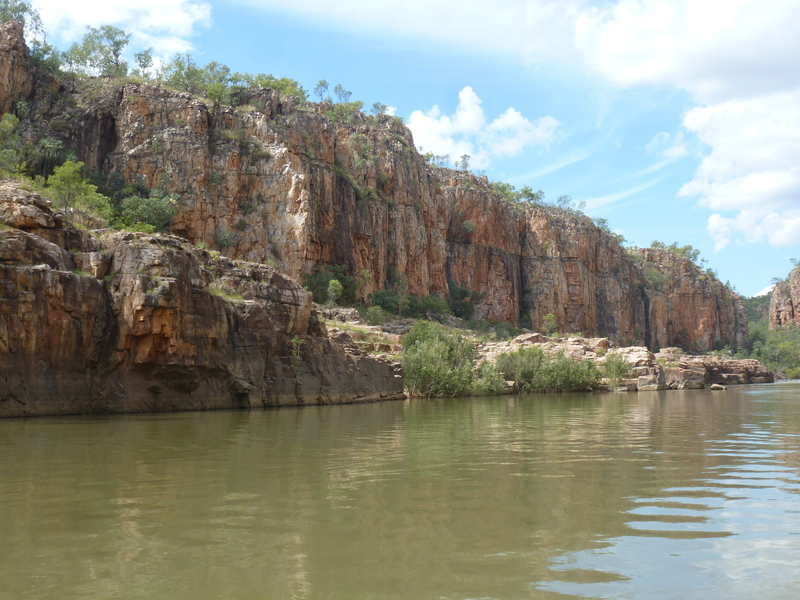 Our final stop was Katherine Gorge itself. 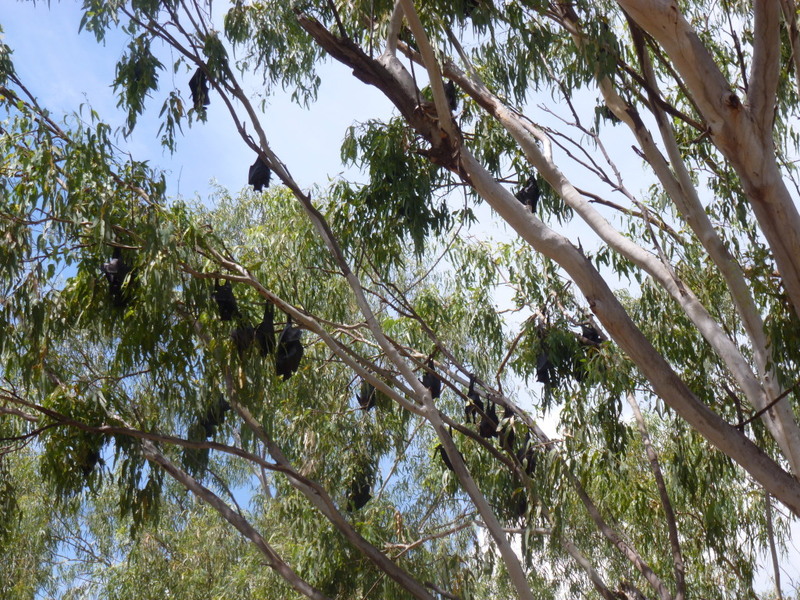 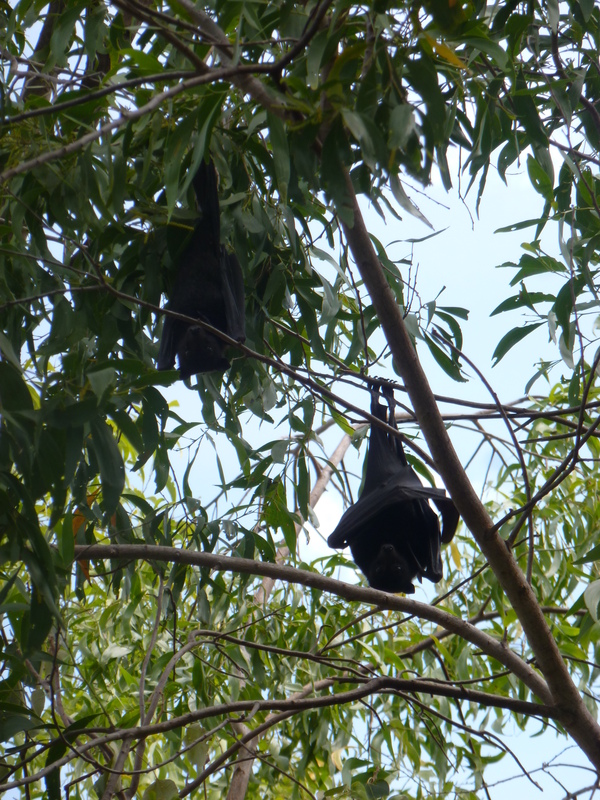 We saw some pretty awesome wildlife here, including hundreds of fruitbats weighing down the trees! 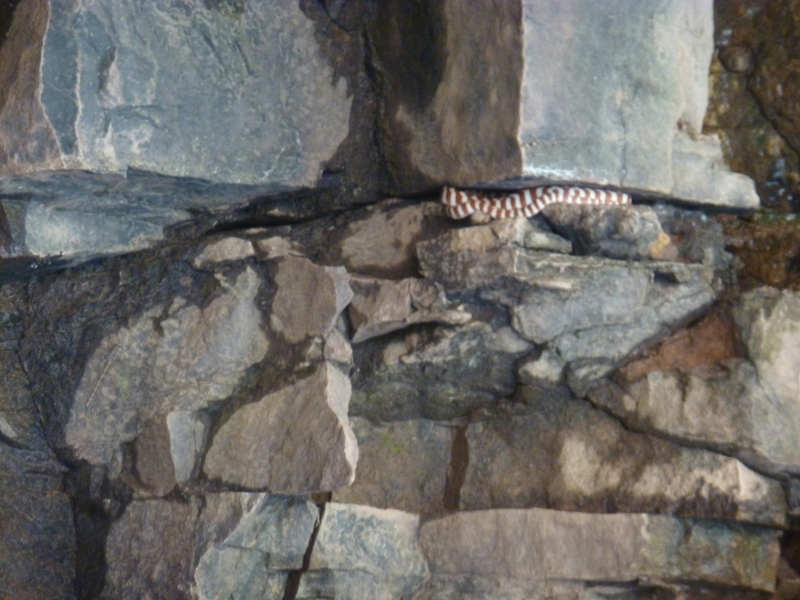 You had to be careful not to walk underneath them for (hopefully) obvious reasons. 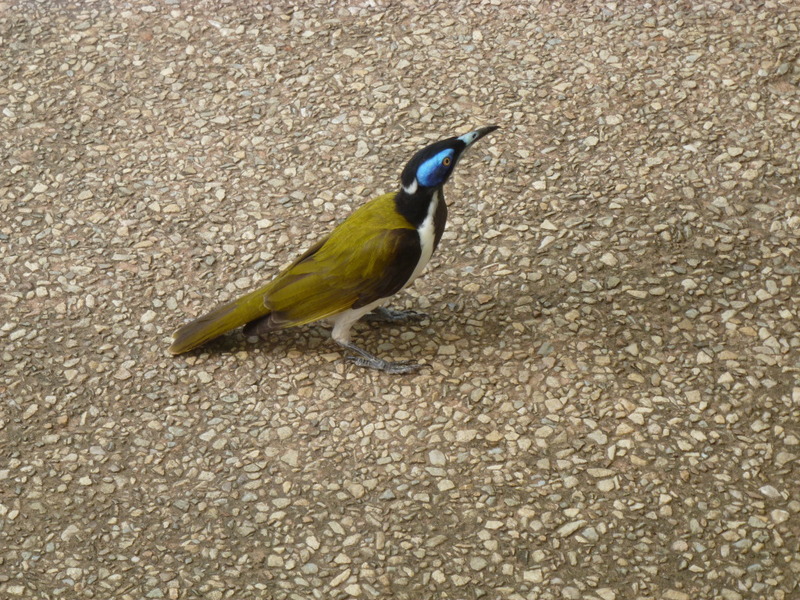 We also saw this beautiful bird (a blue-faced honeyeater, I think) and a banded tree snake.